Ask for funding related to the NM Chile Advertising Act to be suspended. The NM Legislature ends on March 16 2019. Tell them you stand in solidarity with the citizens of NM in opposing the NM Chile Advertising Act. The New Mexico Chile Association (NM Chile Assoc.) 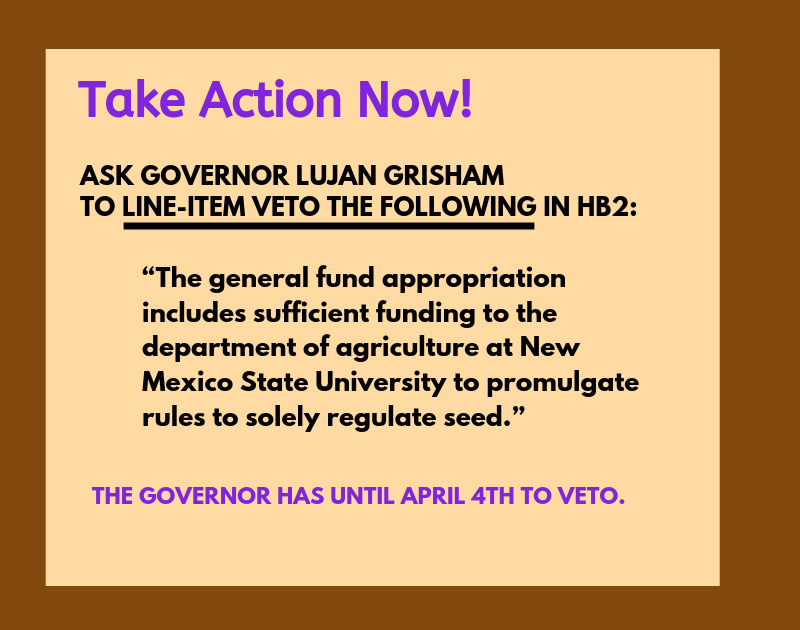 and New Mexico State University (NMSU), in collaboration with BIO (the national biotech lobbyist), the Farm Bureau (Monsanto-Bayer), and ALEC (Koch Brothers) have successfully introduced legislation that threatens every single New Mexican’s right to choose. The amended NM Chile Act, passed in 2012, requires compulsory registration of anyone that describes, labels or sells chile called by the name of any city, town, county, village, pueblo, mountain, river or other geographic feature or features located in New Mexico. Even though that is the varietal name, e.g. Española, Sandia. After going to outrageous lengths to pass this law, the NM Chile Assoc. trademarked the name “New Mexico Certified Chile” and a handful of growers near the city of Hatch trademarked “Certified Hatch Chile”. All the legislative efforts introduced by the NM Chile Assoc. and collaborators are blocks in an entire construct of laws designed to control who owns chile, and now all seeds, and to regulate how they are described, possessed, grown, shared or sold. NMSU is developing a genetically engineered chile for the NM Chile Assoc., using traits from our landrace chiles. NMSU receives legislative funding (on behalf of the NM Chile Assoc. ), will own the seed patent (on genes taken from the public domain), regulates and knows the location of chile farmers (through enforcement of the NM Chile Act by the NM Department of Agriculture), and certifies the seed (NMSU Seed Certification Office). It is wrong to use taxpayer money to prop up one troubled industry at the expense of viable local economies. The NM Chile Assoc. should not be functioning as a governmental entity, nor should they be using taxpayer money to regulate other businesses. The NM Chile Assoc. is an association for private business and has no right to determine laws that affect other businesses, businesspeople or anyone else. The NM Department of Agriculture should not be functioning as an enforcement arm of the NM Chile Assoc. The net effect of these laws is that lobbyists have moved into the legislative and regulatory bodies of government, and are using taxpayer money to do so. 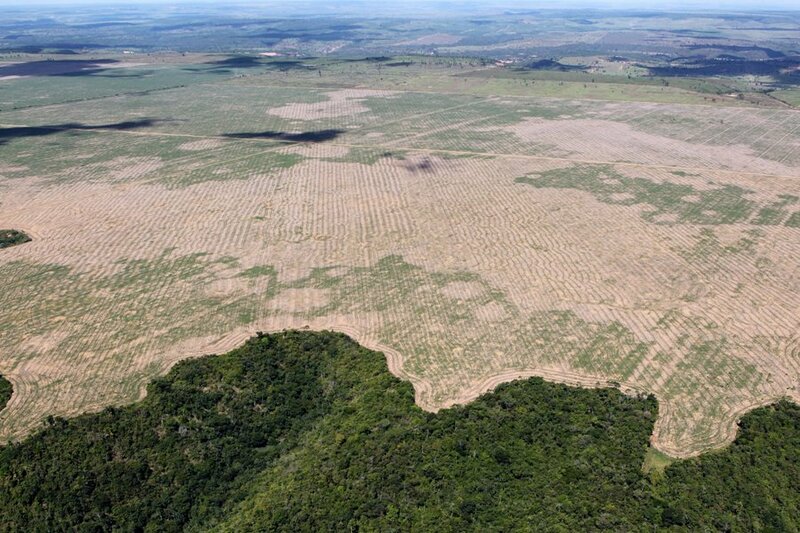 Efforts to trademark and further commodify a staple food crop should never come at the expense of a successful and healthy way of life. 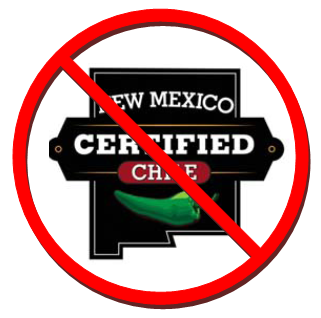 As New Mexicans, we request that the 2019 NM Legislature suspend funding related to the New Mexico Chile Advertising Act that violates our freedom of speech, commerce, and human dignity.